Well known in ancient India as one of the best natural remedies for dandruff, damaged hair due to bleaching, dyeing etc, and hair fall, Cade oil is a significant Ayurvedic oil for treating skin and hair problems. It is also called by other names like Juniper tar, Prickly cedar, Sharp cedar, Cade Juniper and Prickly Juniper and is scientifically known as Juniperus oxycedrus. This small tree is a member of the Cypress family, Cupressaceae. Cade essential oil is extracted from the branches and heartwood of the tree by steam distillation method. Ayurveda recommends Cade and its essential oil in the treatment of various skin disorders like eczema, psoriasis, scabies and skin eruptions along with burning hair problems like hair fall, dandruff and other hair damages. Ancient people of various traditions in the prehistoric times believed that Cade helped them in keeping away from sickness, depressing emotions, negative thoughts and from evil spirits as well. Cade was also used in pagan rituals in Sumeria and Babylonia as a sacrifice to the Gods, while Inanna and Ishtar considered this herb to be holy. The Europeans however considered Cade as a medicinal plant and used it to protect life stock. The word ‘oxycedrus’ means “sharp cedar” and this particular species is considered to be the Cedrus or the original Cedar of the ancient Greeks. Cade is said to have been originated in the Mediterranean region across Portugal and Morocco, south to Lebanon and Israel, east to westernmost Iran and France and grows up to a height of 1600 m altitude above the sea level on rocky areas. The Native Americans used it to treat ailments in animals. Many experts refer to the Juniper tree as a source of protection with perfect loveliness and succor, which are the terms derived from the plant language. Towards the 19th century, the French adopted Cade as well and began the use of the same in the treatment of lice, leprosy, skin infections, snake bites and toothaches. As of today, modern aromatherapy use Cade oil to treat various kinds of skin infections like dandruff, scalp infections accompanied by hair loss, eczema, dermatitis, psoriasis and other skin irritations/eruptions. Due to its skin and hair benefiting properties that help in treating scalp and skin problems, Cade is used in the manufacturing of soaps, lotions, creams and perfumes, and of course these products do have a wonderful aroma as well. Cade oil is said to contain cadinene, creosol, cadinol, p-creosol, terpenes and guaiacol. The major healing properties of this oil are antiseptic, analgesic, antimicrobial, antipruritic, disinfectant, anti-parasitic, vermifuge and vulnerary. The word Ayurveda (Ayur + Veda) means ‘the knowledge of life’ (Ayur means life and Veda means knowledge). Celebrated across the globe as the world’s oldest healing methodology, Ayurveda is lovingly beckoned as the mother of all healing sciences and the most popular medicinal practices that followed Ayurveda are Homeopathy, Siddha, Traditional Chinese Medicine, Allopathy, European Traditional medicine, Chiropractic, Acupuncture and Unani. Ayurvedic medicine rooted the principles of natural healing by treating the root cause of an illness instead of its symptoms and aims at prevention of diseases by helping to lead a disciplined lifestyle and by maintaining perfect balance with nature. According to Ayurveda, everything on earth is a part of nature and nature by itself is made up of five vital elements namely water, earth, space, air and fire. Earth represents bones and muscles, water stands for blood and other fluids in the body, fire is responsible for metabolic functions and body temperature, air aids in breathing and space is the spirit that keeps us alive. Every human being on earth is a unique creation built up with a unique individual constitution just like our fingerprints. This constitution comprises of three dynamic energies called as doshas, which are an arrangement of the five vital elements of nature. Vata dosha stands for air and space and takes care of respiration, circulation and nervous functions of the body. Pitta dosha symbolizes fire and water and is in charge of metabolic functions and body temperature. Kapha represents water and earth and is responsible for physical structure, sustenance and reproductive health. Every individual has a predominance of any one dosha, which decides their personality, traits and behavioral attributes. Perfect balance between these doshas as per nature’s law signifies health and doshic imbalances cause illnesses.Ayurveda prescribes natural remedies like herbs, essential oils, yoga, simple physical exercises, meditation, prayer, Ayurvedic routine, Panchakarma, Pranayama and other Ayurvedic techniques for fostering natural balance between these doshas. Cade oil finds its use in Ayurveda for treating vata imbalances including skin disorders and hair problems and kapha problems like bronchitis and congestion. It serves good for the treatment of itching, pneumonia, diarrhea, diabetes, peptic ulcer, high blood pressure, bronchitis, and many more. 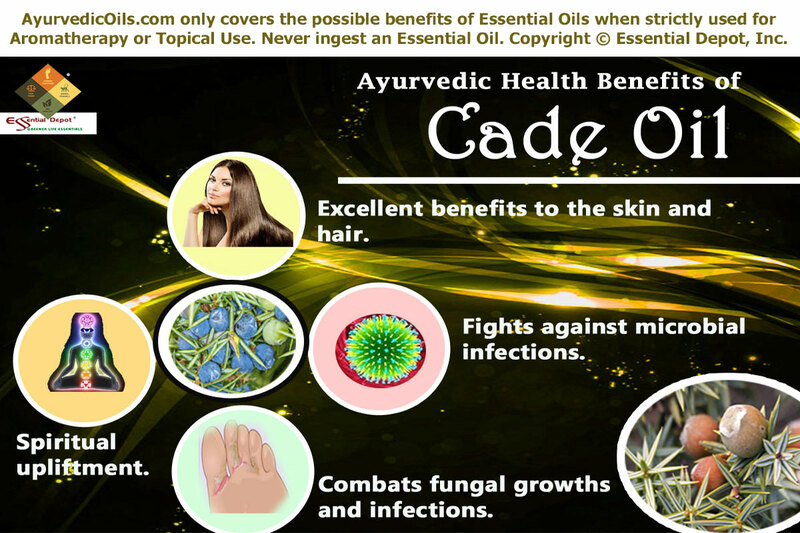 Cade oil has numerous benefits to the skin and hair for which it has been used since the ancient period for treating health problems including dermatological cancers, eczema, psoriasis, skin eruptions, parasitic and fungal infections on the skin, chronic rhinitis and other skin infections. Cade oil is also a proven remedy for treating alopecia or excessive hair loss, dandruff and other scalp problems. It is for these reasons, Cade oil is used as an effective formula in making ointments for treating wounds, psoriasis, eczema, and the treatment of fungal, viral and bacterial conditions of the scalp. Numerous studies have proved the potential effects of Cade oil and its use in medicinal manufacturing of skin creams, ointments, and anti- dandruff shampoos as well. 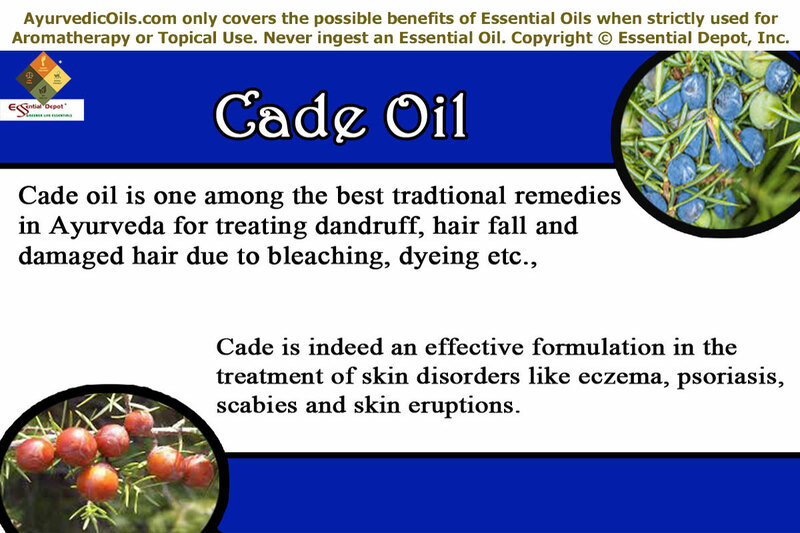 Cade essential oil is used as an ingredient in liniments and ointments for chronic skin diseases and problems of the scalp. Mixing 4 drops of Cade oil blended with 4 drops of Rosemary oil, 4 drops of Thyme oil, 4 drops of Cedarwood oil with 20 ml coconut oil can be used as an effective massage blend for the body for treating all kinds of skin problems, allergies, microbial infections and hair problems as well. This massaging helps in fighting against dead skin cells, promoting quicker healing of wounds, and its disinfectant properties fights against microbes that worsen skin infections. 2 drops of Cade oil added to bathing water or to 10 ml of mild shampoo can act as a potent remedy for treating psoriasis, eczema, ringworm, seborrhea, wounds, herpes, dandruff, lice, loss of hair and other scalp problems as it works by nourishing the skin and scalp, promoting the growth of hair by enriching the hair follicles and support the growth of healthy hair by combating the growth of infectious microbes. Cade oil hair mask for dandruff: To start with, try it out only for few applications and check the results. Make the mixture using the following ingredients, 1tsp castor oil, ½ tsp soya oil, 10 drops of Cade oil and 2 drops of wheat germ oil. Now mix all the ingredients and store in a dark bottle. Massage this oil deeply into the scalp as required. Leave it at least for 2 hours and wash it off using a mild shampoo. Try it twice a week and do check with your medical expert on your diet, as hair loss and other scalp disorders can also be related to other dietary and other lifestyle changes. The essential oil of Cade is a well-known anti-microbial oil and the antimicrobial activity of Juniperus oxycedrus oil was studied through aqueous and methanol extracts of its leaves in the Pelitli Village of Gebze, Kocaeli, in the Marmara region of Turkey, where Cade was extensively used by the people of the same terrain for the treatment of numerous diseases. The effects of the extracts from the tree were employed in its research in the field of medicine. Cade essential oil is dark, aromatic and smells like smoke. This oil is also used as mixtures in cosmetics and creams employed in medicinal applications for skin problems. A 2003 study on the ‘Antimicrobial activity of aqueous and methanol extracts of Juniperus oxycedrus L,’ was conducted on the laboratory strains belonging to 56 bacterial species, and 31 isolates of 5 fungi species. This study proves that the methanol extract of Cade oil proved promising in the inhibitory effects on the growth of 57 strains of 24 bacterial species in the genera of Pseudomonas, Staphylococcus, Bacillus, Brevundimonas, Brucella, Acinetobacter, Enterobacter, Escherichia, Micrococcus and Xanthomonas. 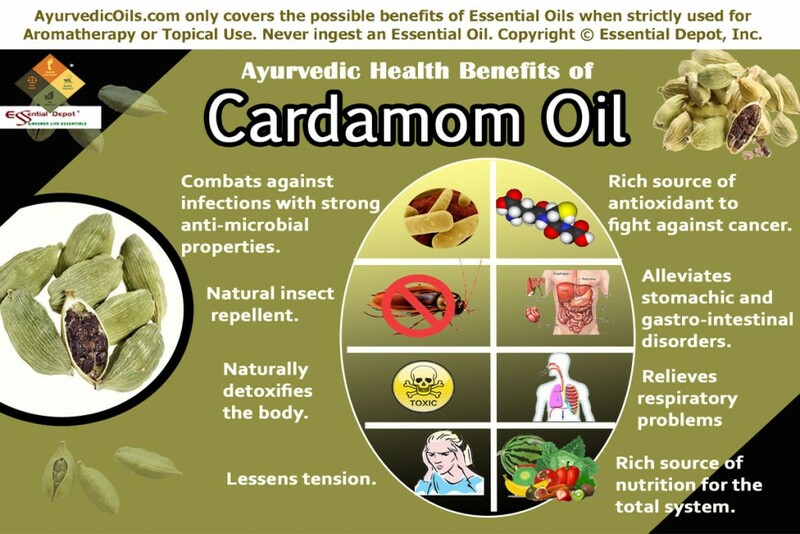 The best way to use Cade oil for fighting against bacteria, fungi, virus and other microbial infections is to add 3 to 4 drops of Cade oil along with 2 drops of Lavender oil in bathing water to fight against existing microbial infections and to guard you against the effects of harmful microbes throughout the day. You can also add 2 drops of this oil to 1 ml of olive oil and apply it gently on the affected area. With its antifungal effects, Cade oil fights against the growth of fungus and checks various fungal infections like ringworm, athlete’s foot, dandruff etc.,. This property is attributed to its presence of chemical constituents tested by GC-MS and its 42 compounds that represent 96.73% of total oil, α-pinene (39.63%), manoyl oxide (12.34), Z-caryophyllene (4.1%) and extensively high amounts of monoterpenes hydrocarbons and sesquiterpenes. The existence of these strong properties makes the oil prove best in its antifungal activities. A 2013 study on the ‘Chemical composition and antifungal activity of essential oil isolated from Juniperus oxycedrus’ states “the antifungal testing by in vitro contact assay showed that the oil significantly inhibits the growth of nine plant pathogenic fungi.” Applying 2 drops of Cade oil mixed with 1 ml of sweet almond oil on the infected parts can help in reducing the severity of the infection and prevent the infestation of new microbes as well. Cade is an amazing Ayurvedic remedy that has been used in incense and utilized especially during prayers, meditation and Pranayama or the art of balanced breathing. The most inspiring reason is the enormous spiritual benefits of Cade oil. Adding 2 drops of this oil in your diffuser, room freshener, vaporizer or aromatic candles during prayers and meditation can be of great assistance in helping you forget the pain of being abused, quit addiction, fear of being neglected, alleviate negative emotions and re-align the spiritual and emotional elements of the system. Regular meditation, simple physical exercises, prayers and Pranayama assisted with Cade oil can aid in augmenting your spiritual quotient and elevate your bonding with the divine. Cade essential oil have also been in use since the ancient times in the treatment of pain, joint aches, leprosy, toothaches, snake bites, lice, dandruff, cancer, peptic ulcer, pneumonia, high blood pressure, skin irritation, bronchitis, diarrhea, itching and few other infections. This article is for educational uses only. We are not medical professionals and this information is not directed to diagnose, cure or prevent any medical conditions or to substitute any prescribed drugs or professional medical advice. This info is shared with the motive of spreading the Ayurvedic healing wisdom, which is the world’s oldest medicinal system. Care should be taken while using essential oils topically, as pure and organic oils are highly concentrated liquids and should always be used in a diluted form. Never use essential oils internally and keep them out of reach of children. Make certain that you talk with your Ayurvedic practitioner or healthcare professional before choosing the appropriate essential oil for your individual constitution and medical condition. This oil should be avoided during pregnancy and breast feeding and do not use it directly on broken or inflamed skin. “Cinnamon is empowering to the will and is one of the best oils for circulation especially during menopause”, says Light Miller in her book Ayurveda and Aromatherapy. This oil also enhances blood circulation, supports the functions of the heart, augments sexual function, improves digestion, boosts sexual desire and controls diabetes. The essential oil of Cinnamon is obtained from the dried inner bark of the Cinnamon tree, scientifically known as Cinnamomum zeylanicum (now called as Cinnamomum verum) by steam distillation method. 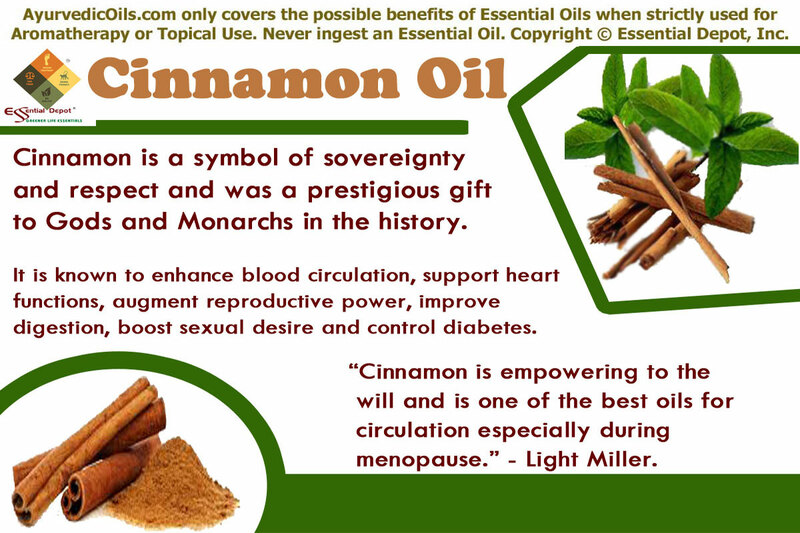 Cinnamon is a symbol of sovereignty and respect and was a prestigious gift to Gods and Monarchs in the history. Called as Darusita or Tvak in Ayurveda, Cinnamon has a long history in Ayurvedic medicine for treating malaria, diabetes, menopausal problems, headache, bad breath, digestive disorders, impotence, anemia, sinus congestion, dyspepsia, blood circulation, scabies, intestinal infections and gynecological problems (used even as a natural birth-control aid). Cinnamon is a small bushy evergreen tree that is indigenous to South Asia, especially to Sri Lanka and India. It is credited as one of the three oldest herb known to the ancient world along with Myrrh and Frankincense. The oldest historical reference of Cinnamon is its description found in the ancient Jewish religious text Torah. Biblical texts talk about Cinnamon and its esteemed uses in various places and the most noted among them is the command to Moses to make use of cinnamon and cassia in the holy anointing oil. Solomon describes the charm of his love by saying that her garments scented with cinnamon are like the smell of Lebanon. In various proverbs it’s been mentioned that the bed of the lovers is adorned with the aroma of cinnamon, aloes and myrrh. The primordial Indians used Cinnamon as a condiment and in Ayurvedic healing before 8th century and the traditional Chinese physicians used Cinnamon as early as 2700 B.C. It was also imported to Egypt in 2000 B.C. Pliny the Elder, Dioscorides, Galen and many other renowned herbalists have documented the therapeutic uses of Cinnamon. Cinnamon was held high in the ancient period and was valued more than 15 times of silver (about 350 grams of Cinnamon was equivalent to that of 5 kgs of Silver in the 1st Century). The traditional Egyptians used Cinnamon and its essential oil in embalming dead bodies and in preserving meat. Ayurvedic system used Cinnamon for controlling the blood sugar level and for assisting digestive disorders. Its essential oil was used in pacifying the nerves and muscles. The Traditional Chinese Medicine used this herb as an aid in treating painful and delayed menstruation, diarrhea, cold, cough and other respiratory problems. Cinnamon was burnt as an offering in religious ceremonies and also for sanctifying the atmosphere. It was used by the primeval Romans attaining the healing powers for spiritual wellness. The Gas chromatography report witnesses Cinnamon oil with about 15 chemical constituents that contribute to its distinct aroma, remedial values, consistency and superiority of this splendid oil. Among which, (E)-Cinnamaldehyde has the highest area with a proportion of about 76.8% of Cinnamon oil components. I certainly trust that this information would help in having a clear picture about the major chemical constituents of Cinnamon oil. The table crafted below elucidates the unique nature and therapeutic attributes of these biochemical constituents to the medicinal magnificence of Cinnamon essential oil. The remedial properties of Cinnamon essential oil are antioxidant, astringent, antibacterial, antimicrobial, anti-clotting, anti-fungal, cardiac, emmenagogue, stimulant, analgesic, antibiotic, vermifuge, tonic, aphrodisiac, stomachic, diaphoretic, diuretic, anti-parasitic, alterative, expectorant, antispasmodic and carminative. Ayurveda is the oldest healing systems on earth that focuses on a holistic approach for healing, preventing and ensuring longevity for humanity. By the word holistic, Ayurvedic remedies aim at granting complete health including the physical, mental and spiritual health. This is because, this traditional Indian methodology strongly believes that these three aspects of health are inter-related and the weakness of any of these aspects will directly or indirectly affect the other two. This is explained in the Sutrasthana of Charaka Samhita, the oldest Ayurvedic encyclopedia as “The three – body, psyche, and soul – act as a tripod. The world stands upon them, and within them, the world abides.” Ayurveda is an absolute common sense science that stimulates proper functioning of the system, peaceful sleep, emotional tranquility, spiritual oneness and takes you a brand new world of energy and enrichment. The exclusivity of Ayurveda lies in its individual attention for every person even if a group of 10 people are affected by the same illness. The typical ‘one size fits all’ principle of the modern medical system never holds good for a natural healing technique like Ayurveda. Here every individual is considered as a unique part of nature, made up with the five elemental forces of nature. They are fire, earth, water, space and air. These five elements represent themselves in the form of three biological energies known as doshas, namely vata, pitta and kapha. These 3 doshas join together to form an individual constitution, which makes every person unique with a specified set of physical, mental and spiritual attributes. Vata is a combination of air and space and is in charge of respiratory functions, nervous system and the process of circulation. Pitta stands for fire and water and is responsible for body temperature and the process of metabolism. Earth and water put together forms kapha dosha and is accountable for structure of the body, functions of the fluids in the system and sustenance. Every individual has a unique combination of these doshas. Balance between these doshas indicates healthiness and imbalance due to lifestyle, food habits and other environmental factors lead to doshic imbalances causing illnesses. Ayurveda recommends the use of natural remedies like herbs, yoga, essential oils, meditation, Ayurvedic routine, prayers and other Ayurvedic therapies according to the individual constitution of a person, so as to correct the imperfect balance of doshas. Cinnamon essential oil is a perfect Ayurvedic essential oil to treat the surplus of vata and kapha doshas and the deficit of pitta dosha. This makes Cinnamon oil a prime choice in treating digestive problems as it’s known to enhance the ‘agni or fire’ in the system that is responsible for metabolic functions. 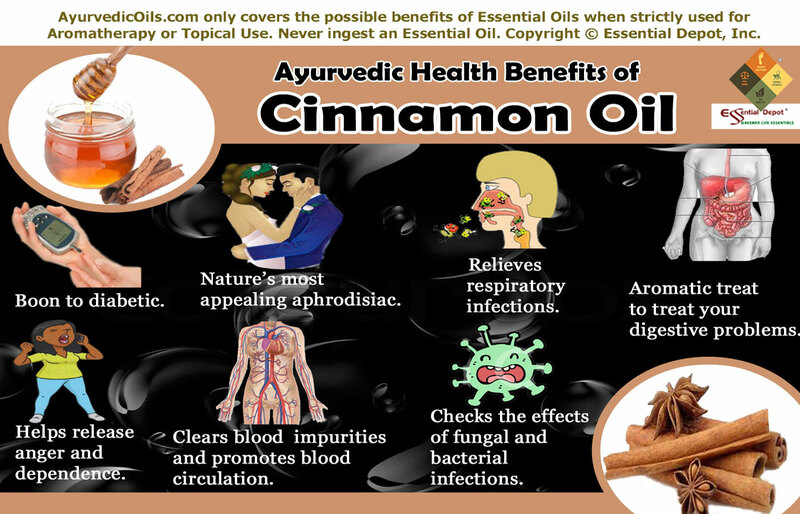 It’s time to have a look at the Ayurvedic health benefits of Cinnamon essential oil. In an Ayurvedic perspective, diabetes is a disarray of kapha unevenness occurred due to weakened digestive fire. Cinnamon is a nature’s wonder herb for treating increased kapha dosha and enhance the flow of pitta energy. This is mainly because of its warming properties that help in encouraging Agni or the digestive fire that supports the balanced functioning of the digestive system. Cinnamon is habitually prescribed for people with kapha dosha predominance and these people generally hold a wet, cold, heavy and slow mechanism of the body. By this way, using Cinnamon essential oil either in a massage blend or in inhalation along with an Ayurvedic diet and Ayurvedic routine that includes healthy lifestyle changes, meditation, prayers, yoga and other simple physical exercises for controlling the blood glucose levels of the system, thus having a check on diabetes. A 2003 study on Cinnamon for diabetes established that taking Cinnamon supplements regularly for 40 days decreased blood sugar and level of cholesterol in type 2 diabetes patients. Massaging your body with 10 drops of Cinnamon essential oil blended with 5 to 7 ml sesame oil can help in regulating the blood sugar level with its pungent aroma and heating energy. The therapeutic properties of this oil enters the blood stream by penetrating through the skin cells and act directly on the cellular structure. It also aids in controlling the digestion of sugar and fatty substances, which helps in providing resistance of insulin in Type 2 diabetes. The warming, stimulating and aphrodisiac properties in Cinnamon help in increasing the body temperature and helps in arousing strong sexual desire in men and women. Massaging your lower abdomen, genital parts and thighs with 5 drops of Cinnamon oil mixed with 2.5 ml virgin olive oil can help in improving sensual feelings, augmenting libido in both male and female, treat impotency and erectile dysfunction. Inhaling the healing aroma of Cinnamon oil by adding 2 drops to your burner, vaporizer or diffuser along with this massaging can act as a great aid in strengthening the uterus muscles, relieving menstrual pain, regularizing blocked menstruation, washing out uterine congestion, and inducing labor pain. This is due to the tendency of Cinnamon to stimulate the secretion of Oxytocin hormones responsible for increasing uterine contractions and enhancing the production of breast milk. Cinnamon has an euphoric aroma that increases the secretion of digestive acids and gastric juices by enhancing agni or the digestive fire. The slightly bitter and pungent taste of Cinnamon along with its hot potency aids in processing ama or the undigested toxic substances, reducing heaviness of the stomach, treating sluggish bowel movements and alleviating abdominal pain. Inhaling the energizing aroma of Cinnamon oil by adding 2 to 3 drops of this oil in burner, vaporizer or your hanky along with a warming massage of your abdomen with 4 drops of Cinnamon oil blended with 2 ml of coconut oil can assist in treating colic, slow digestion, nausea, dyspepsia and diarrhea. Ayurveda describes most of the respiratory disorders as kapha imbalance. This excess kapha stockpiles in the respiratory passages in the form of mucous and phlegm deposits and cause hindrance in the free movement of air to the lungs and nasal passages. This is why many or all of the respiratory illnesses are accompanied by breathing difficulties. Cinnamon essential oil has kapha-reducing properties with its bitter, hot, pungent and penetrating qualities. The expectorant, decongestant and demulcent properties of this oil help in loosening the thick phlegm and mucous secretion in the nasal passages and the respiratory tract. The anti-tubercular activity of cinnamic acid present in Cinnamon oil also helps in treating tuberculosis, chronic cough and asthma. Adding 3 drops of Cinnamon oil in steam inhalation can be extremely helpful in warming up the lungs, liquefying nasal and chest congestion and eliminating phlegm and mucous in the bronchial passages. 2 drops of this oil added to vaporub and massaged gently on the throat, chest and back can also assist in relieving stuffy nose, watery eyes, nasal congestion, headache and cough. The sweet smelling oil of Cinnamon has been found to boost memory power and cognitive functioning abilities of the mind. Many Ayurvedic schools have recommended Cinnamon for enhancing memory skills. Cinnamon essential oil empowers the willpower and purifies the spirit. 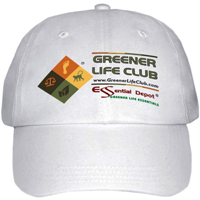 This aids in treating mental fatigue, anger, tension, anxiety, depression and other negative feelings. This oil affects the Solar plexus chakra, which connects our personal fire with that of the world revolving around us. Fears of criticism, rejection and lack of self-confidence affect the functioning of this chakra. Using 2 drops of Cinnamon oil in bath or in diffuser or vaporizer can help in increasing one’s feelings of independence and promotes one to take risks with confidence and power. Cinnamon essential oil has blood purifying properties that are attributed to its stimulant and cleansing remedial values. It helps in eliminating the toxic substances in the blood through urine and sweat. 2 drops of Cinnamon oil added to diffuser during Pranayama, the technique of balanced breathing followed by a meditation can help in discarding the toxins in the blood through exhalation, enhancing Ojas or the vital energy for longevity, stimulating the cardiac functions and granting mental peace and improved blood circulation especially to the six chakras in the body. The essential oil of Cinnamon is an effective immune system booster by nature. It also has antibacterial, anti-fungal and antiviral properties that curb the growth of disastrous micro-organisms in the system. Mixing 2 drops of Cinnamon oil with 1 ml of almond oil and applying it on the affected parts can help in healing wounds, burns, cuts, candida, boils, itches, athlete’s foot, and ringworm and prevents the wound from turning septic. According to a 2006 study by the Saurashtra University, India, Cinnamon essential oil extracted from the bark of the Cinnamon tree got attained 42.5 out of 50 for its anti-fungal activity, whereas Hexaconazole, a popular fungicide often used in agriculture scored only 22.5 for 50. This witnesses the effectiveness of Cinnamon oil in treating fungal infections like ringworm, athlete’s foot etc. Another study published in the International Journal of Food Microbiology proved that Cinnamon oil killed about 92% of gram negative and gram positive bacteria out of the 25 tested bacterial strains. Another source states that Cinnamon used in a blend with Eucalyptus, Rosemary, Clove and Lemon has the potent to kill about 99% of airborne bacteria in just 12 minutes. Apart from all these health benefits, Cinnamon oil is used as a flavor in baked products, candies, desserts, soups, pickles, stews, beverages, meat and poultry etc. It is also used in skin care creams and lotions for enhancing the skin complexion and removing impurities and skin blemishes. This article is only for informational and educational purposes and is written purely in the interest of sharing the traditional wisdom of the Ayurveda, the oldest of all healing sciences. It is not meant to treat, prevent or diagnose any health conditions or replace any kind of prescribed medicines or expert advice or a medical professional. Never use essential oils internally. Do remember to dilute essential oils in appropriate carrier oils before using it on the skin externally as pure and organic essential oils are the life essence of plants and are highly concentrated substances. Consult your Ayurvedic expert/healthcare professional before choosing the appropriate essential oils for your unique constitution and health condition. Keep away from children, pregnant women and nursing moms. 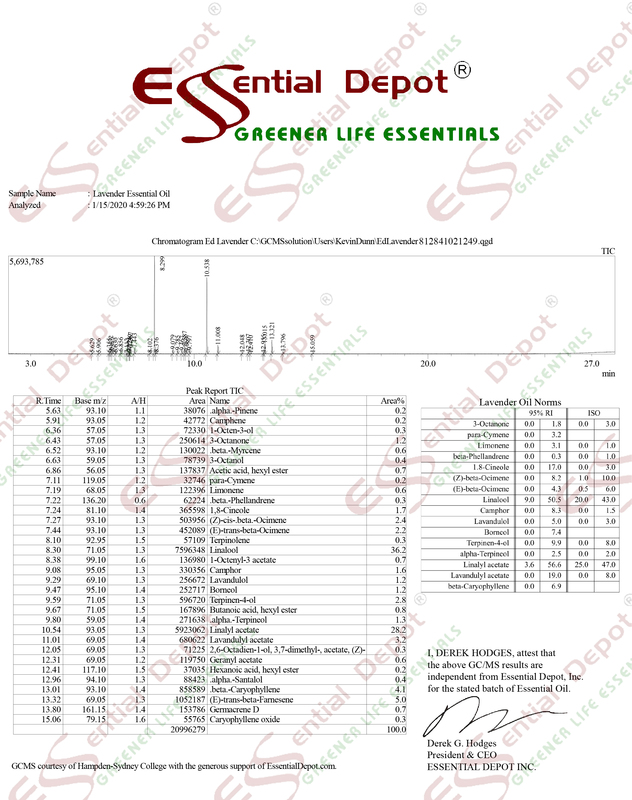 The MSDS (Material Safety Data Sheet) of Cinnamon oil is readily available for your enhanced safety and better usage. 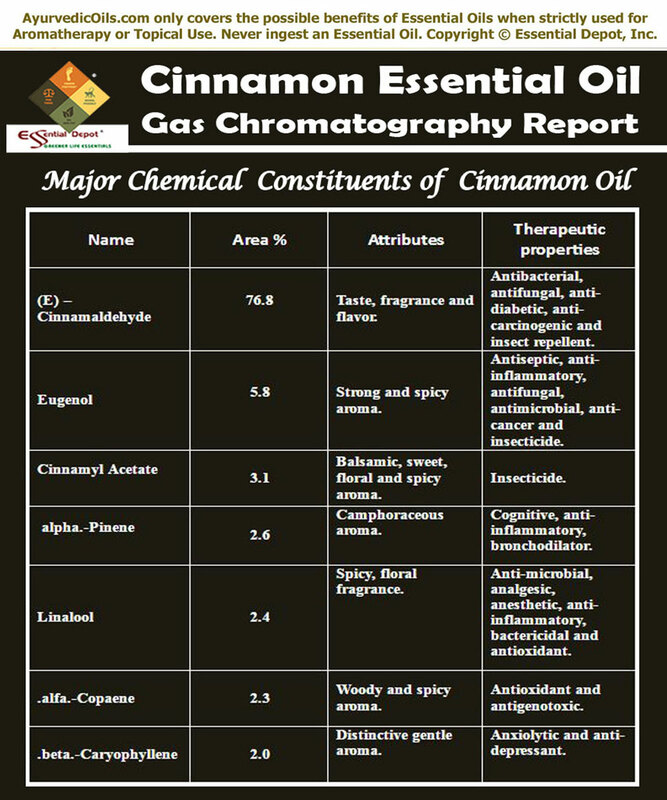 Gas Chromatography Report (GC analysis) of Cinnamon oil. Besides being an indispensable spice and herbal remedy, Cinnamon is reported for negative effects including possible skin issues like allergic reactions, irritation of the skin, stimulating menstruation, contracting the uterine muscles, skin sensitization, dermatitis and burning sensation. It is highly advisable to avoid Cinnamon oil during pregnancy as it may shrivel the uterine muscles, cause indigestion, pain in the abdomen, contribute to premature labor and is completely unsafe for the development of the fetus. The major chemical components that are in charge for the potential skin problems and other adverse health conditions of Cinnamon oil are Cinnamaldehyde, cinnamic acid and cinnamyl alcohol. It may cause a burning sensation or irritation on the engaged parts when used in the form of skin care, oral hygiene (toothpastes and mouthwashes) and pain relieving products including ointments and rubs. Cinnamon oil, with the presence of these constituents is said to cause subchronic and severe toxicity, when used beyond the prescribed level of use. The maximum recommended usage level of Cinnamaldehyde by The International Fragrance Association (IFRA) is 0.05%. Though Cinnamon has GRAS (Generally Regarded As Safe) status, The Council of Europe has fixed an ADI of 1.25mg/kg for Cinnamaldehyde, which is the same as an adult dosage of 115 mg of Cinnamon bark oil. Essential oils are recommended only for dermal application and never ingest Cinnamon oil as it may cause toxic effects on the liver (hepatotoxic), kidney (nephrotoxicity) and the entire system. Diluted Cinnamon oil in appropriate carrier oils is prescribed safe and concentrated use may cause chronic allergies, irritation, dermatitis and chronic sensitization. Studies witness severe burns in people due to the skin contact of undiluted Cinnamon oil and is commonly related to burning sensation in the skin, mouth, mucous membrane stomach and chest , intermittent blistering, nausea, dizziness and sensitization accounted to the presence of Cinnamaldehyde. This also applies to the use of Cinnamon oil in vapor therapy and dermal application. Cinnamon oil is said to have mild phototoxic effects, control platelet aggregation (Do not use Cinnamon oil if you are taking anticoagulant and anti-diabetic medications). It may cause reproductive toxicity (when tested on pregnant mice, it decreased the count of nuclei and modified the embryo distribution). Always do a patch test before using Cinnamon oil on your skin. Leung’s Encyclopedia of Common Natural Ingredients, used in Food, Drugs and Cosmetics by Ikhlas A. Khan and Ehab A. Abourashed.